Now dean of the California College of Arts (CCA) in San Francisco and Oakland, Lawrence Rinder is known for his wide-ranging curatorial work. 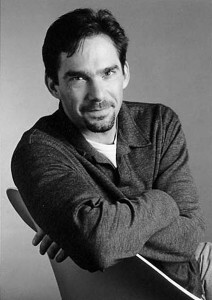 He was Anne and Joel Ehrenkranz Curator of Contemporary Art at the Whitney Museum of American Art in New York from 2000 to 2004, where he organized the 2002 Whitney Biennial, among other exhibitions. He helped to found the CCA Berkeley Art Museum as curator of twentieth-century art and curator of the Matrix program. Rinder received a BA in art from Reed College in Portland, Oregon, and an MA in art history from Hunter College, City University of New York. 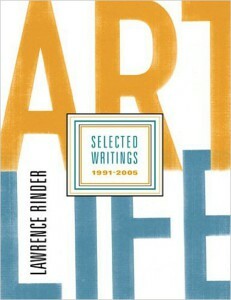 A collection of Rinder’s essays, Art Life: Selected Writings 1991–2005, was published this year by Gregory R. Miller. Being a dean seems like a totally different beast than organizing art exhibitions. What do you hope to accomplish in a college that you couldn’t in a museum? Indeed, it is an utterly different enterprise. As dean, my primary responsibility is to lead others to do their best work. Previously, when I was dean of graduate studies at CCA, I supervised the chairs of the graduate programs and found great satisfaction in helping them to clarify the ambitions of their programs and to develop curricular structures that would form the basis of innovative and effective pedagogies. I was especially engaged by the challenge of working with people in a wide variety of fields—some of which were relatively unfamiliar to me, such as design, writing, and architecture. A great benefit of being an administrator at that level was that I was instantly introduced, by the chairs, to the most cutting-edge issues and ideas in each of these fields. I have always been interested in how the arts extend horizontally into related fields. For example, one of my first exhibitions (back in 1989) was an architecture competition I organized to redesign the legendary gallery Nature Morte in the East Village. I have often worked with nonart writers in my curatorial projects, such as my collaboration with George Lakoff on the exhibition Searchlight: Consciousness at the Millennium. However, my exposure to these fields was a fraction of what I have gained over the past two years at CCA, a school where interdisciplinarity is not just a side effect of academic administration but a core learning objective of the college. Since being promoted to dean of the college, my relationship to these disciplines has changed somewhat. Instead of having a variety of program chairs reporting to me, I have three associate deans. So I am firmly ensconced in the administration, and my role is more clearly defined as overseeing broad, college-wide curricular initiatives instead of focusing on particular programs or disciplines. Despite some personal concern that this would take me too far from the issues I enjoy, I have found that there is another, equally engaging set of questions to address. Specifically, I am exploring the possibility of developing a closer rapport between artists and designers, thinking about college-wide requirements for project-based interdisciplinary collaborative courses, and rethinking the relationship of the so-called craft disciplines (textiles, ceramics, and glass) to both art and design. All these issues are easily as interesting and timely as the questions I was exploring as a curator. And I get to see much more art everyday than I ever did working at a museum! What experiences did you have as dean of the graduate program that will help you oversee the entire college? My first challenge when I was appointed dean of graduate studies (there had not been a position of this kind at the school before my arrival) was to make sure the programs had clearly defined goals that were in alignment with the college’s strategic plan. I also hoped to develop a more coherent sense of identity across the programs, a sense of what it meant to be a graduate student at CCA. To this end I asked each chair to work with their faculty to draft a working document articulating their program’s mission as well as to describe their short- and long-term goals, categorized generally according to the college’s three strategic goals: (1) develop national visibility through academic excellence; (2) maintain a sustainable business model; and (3) improve internal and external communication. The chairs were instructed to provide concrete metrics for each goal. I was concerned initially that this kind of “managementy” approach would be considered overly bureaucratic within an academic setting, but it has turned out well. The chairs report that working on—and reworking annually—these documents has provided them with a constructive tool for articulating and attaining their goals. I intend to conduct this process on the undergraduate level as well. CCA’s graduate program covers six distinct but often overlapping areas—architecture, curatorial practice, design, fine arts, visual criticism, and writing—and the undergraduate program embraces more (fashion, industrial design, illustration, etc.). What are your roles in each? You’ve had a fairly diverse career, so it seems like you have something to say about all these areas. My main area of experience is fine art. I studied both art practice and art history in college and then worked for almost twenty years as a fine-art curator. However, I was lucky in most of my museum jobs to be able to wander occasionally into terrain more typically considered to be “design.” I included several architects in the 2002 Whitney Biennial, for example, and as director of CCA’s Wattis Institute I was able to program a number of exhibitions that explored cutting-edge developments in architecture, industrial design, and fashion. So, one of the things that attracted me to this job—and to CCA more generally—is the mix of disciplines that can be addressed here. In two years, I have learned a tremendous amount about contemporary issues in architecture and design. For a variety of administrative reasons (faculty searches, curricular reviews, etc. ), I have actually been more involved in these areas over the past year than in the fine arts. I find the design disciplines to be utterly fascinating and an area where CCA truly distinguishes itself as a leader among American schools. You’ve spent some of your career in New York but most of it in the Bay Area. How important is New York to recent grads? I was born and raised in New York. I went to college there and spent many years of my professional life there. So it would be crazy for me to say that New York doesn’t matter. However, I do think that an artist, writer, curator, or designer can “make it” today without having to live there. It helps, of course, to know the networks and powerful individuals who are located in New York. I always advise students who ask me about this to spend at least two years living there at some point early on, so that they gain some familiarity with the scene. New York remains the commercial center for all these fields. But, on the level of practice, I think that there are many advantages to getting out and living in other, more dynamic parts of the country and the world. How has the transition been from longtime curator to academic administrator? Do you have exhibition projects in the works now? In some ways I feel like I’ve finally grown up and gotten a real, adult job. It is so much harder than curating! I’m enjoying it, but it’s a real challenge. I’d say the most positive thing about it is feeling that I can be truly instrumental in addressing critical needs, not only in educational methodologies but, more importantly, in helping to develop programs that address some of the really significant social, cultural, and environmental issues of our time. As for exhibitions in progress, yes, I do have a couple ideas. The one that seems most likely to happen is a show I’m doing with Aaron Peck, which will include a small selection of works on paper by Mark Tobey and Hedda Sterne. It’s a labor of love. You were a founder of the CCA Wattis Institute for Contemporary Arts. What is your relationship to this art center now? After I left CCA to work at the Whitney Museum in 2000, Ralph Rugoff became the director and did a fantastic job of putting it, and CCA, on the international map. The Wattis’s new leader, Jens Hoffmann, formerly director of exhibitions at the Institute of Contemporary Art in London, will no doubt extend that reputation even further and in new, compelling directions. He is an extremely inventive curator with a boundless imagination! As his supervisor I consider it my role to basically leave him alone to do his job, give feedback when he wants it, and help to provide the resources he’ll need to make it all happen. Some of your Whitney exhibitions, such as the 2002 Whitney Biennial or The American Affect, naturally received mixed reviews. 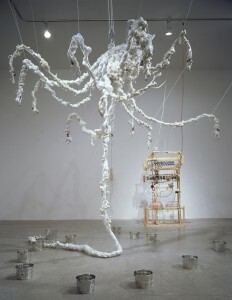 Others, like Tim Hawkinson, were highly praised. How do you deal with criticism of your curatorial work? In general, I don’t read reviews. After reading quite a few reviews, early on, by powerful critics who just didn’t get it, I have basically decided to ignore the whole critical establishment. I depend much more on feedback I get from visitors or from friends or colleagues whose opinions I trust. Having said that, I admit to having read reviews that friends told me were really great—just for the ego-boost and not to learn anything about my work. Your response is curious, seeing that CCA has programs in visual criticism and writing. How do you reconcile your personal attitudes about reviews with what your students are learning? I didn’t say I didn’t read! I love books and read fiction voraciously. I also have been writing quite a bit and have just finished my first novel. Being in San Francisco I have been exposed to a fantastically rich local literary community. One of the great things about this area is that the worlds of writing and art (as well as music) really overlap in a way I never experienced in New York. Recently, for example, I wrote a play with Kevin Killian that we presented at CCA with a cast of many leading San Francisco artists and musicians. 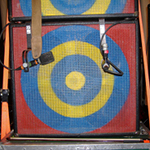 As for Visual Criticism, that program provides much more than training for art critics. It is very broadly conceived to engage a very wide range of visual culture, including architecture, design, and vernacular imagery as well as art. While some of the graduates go on to become critics, others continue in academia or go into related fields such as curating. Your new book, Art Life: Selected Writings 1991–2005, is a subjective and personal approach to art. It is also highly accessible and jargon-free. I also noticed that a lot of the essays originally appeared in exhibition catalogues. How does that venue for writing differ from criticism or scholarly writing? Except for papers I wrote in college, I’ve never really done scholarly writing. Although I went to a school that encouraged a kind of arcane, scholarly writing style, I was quickly disabused of that approach when I worked for three years—right out of college—in the New York public-school system, under the auspices of MoMA, lecturing on art to high school and junior high school students. These students helped me to learn that one can speak clearly and meaningfully about even some of the most difficult contemporary art without resorting to complex terminology or mind-numbing abstractions. Ever since then I have tried to keep jargon out of my writing and to address my reader as a peer who might even have an opinion different from my own. Writing in an exhibition catalogue, one often has more latitude, stylistically speaking, than one does writing criticism or scholarly papers. I think being in the museum field has helped me to develop a more personal voice in my writing. Originally published in CAA News in November 2006.